Fur can be really rewarding to sew, but boy does it make a MESS! If I have learned anything though as a Mother of young children, its that sometimes the best memories are made when we roll up our sleeves and get a bit dirty. The same goes for sewing with fur! Every now and then you simply have to take the plunge, knowing that a mess will be made but that the outcome will be absolutely fabulous. Through the years I have worked with this unique textile on numerous occasions, from costumes to apparel to chic accessories, and with every new project my apprehension shrinks. The fur itself isn’t changing, rather my attitude towards it. 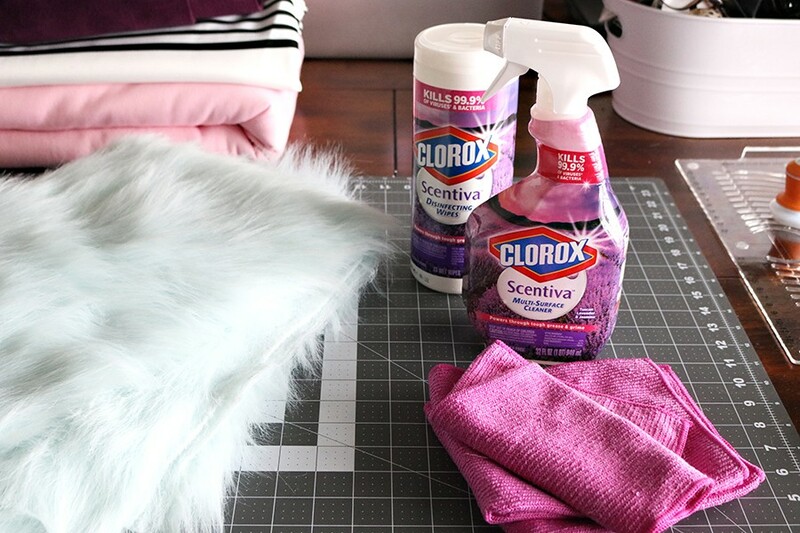 By combining my knowledge base on how to sew fur successfully, with some tips and tricks I have learned along the way, I am saving my house (and my sanity) from the mess! 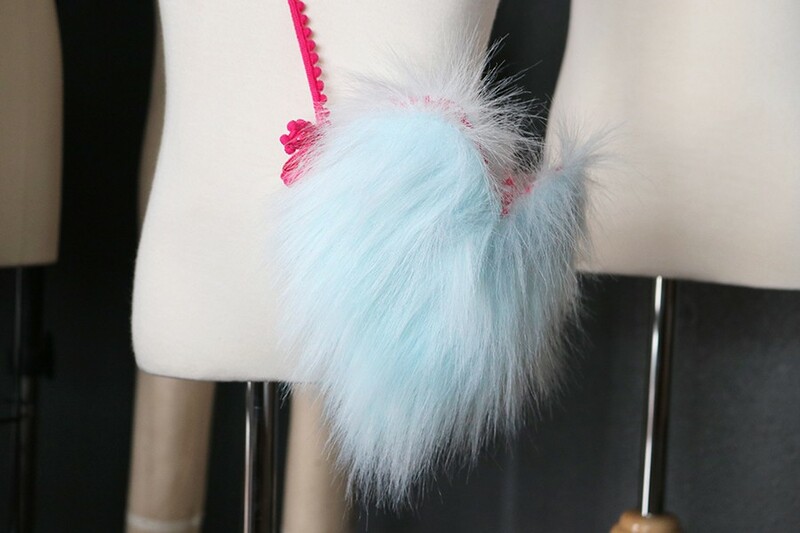 The key to sewing with fur is changing your mindset. 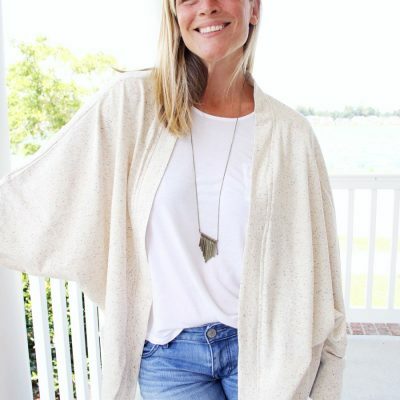 Unlike other projects, where you typically wait until you are finished sewing to clean, fur needs a bit more tender loving care in the in between steps. It’s really easy to put these processes in place, does not add much time to the sewing process, and your house will thank you for it. All it takes is a little bit of forethought. Here are some tips and tricks that help minimize the fursplosion. Tips for sewing with fur that will help save your house, and your sanity! 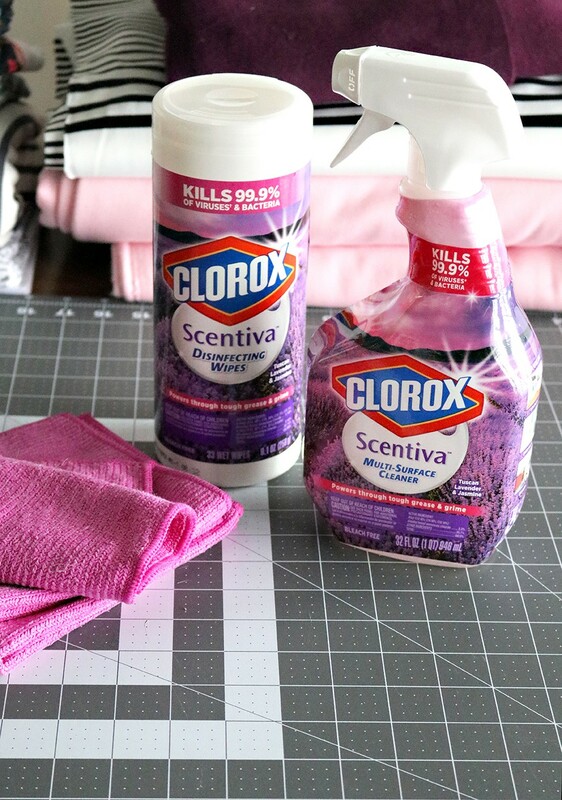 For this post, I was asked to try the new Scentiva spray and wipes by Clorox in my home studio. Seeing as how I have fallen in love with this mint fur lately, and have already made 2 DIY posts (women’s fur and leather stole, and kids fur muff), it was a natural fit. The all new Scentiva by Clorox comes in both a spray or wipes, and is available in 2 scents, Tuscan Lavender and Jasmine & Hawaiian Sunshine. I chose the Tuscan Lavender & Jasmine as it smelled great when I tried it out at my local Target store. 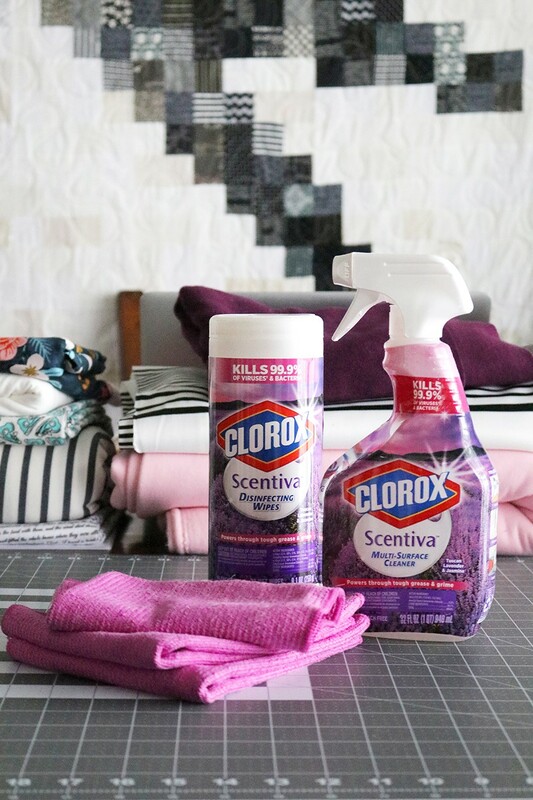 Scentiva is an all-in-one solution that has all the power of Clorox clean, combined with an amazing scent, that leaves my sewing studio smelling great all day long. Below is a quick video sharing my tips and tricks for sewing with fur, and how a little bit of cleaning and forethought can help keep the mess of fur down to a minimum. Know the direction the fur lays (the grain), and trace the pattern onto the back of your fabric accordingly. 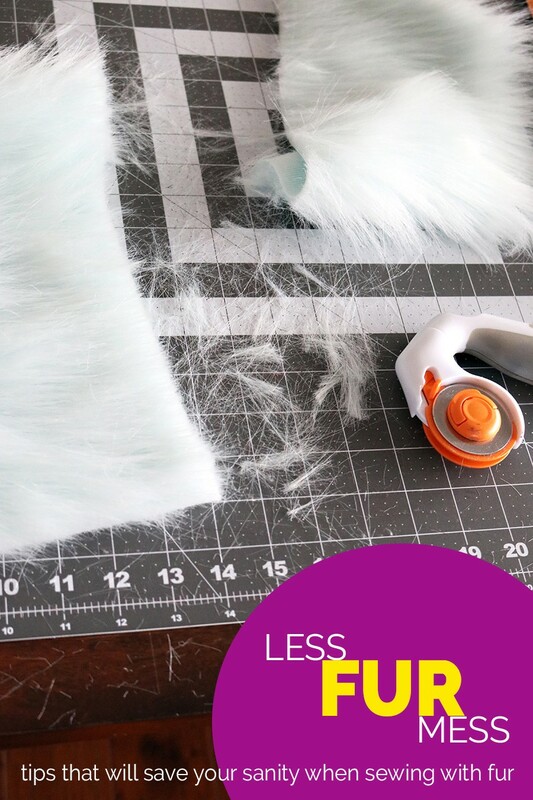 When cutting out the pattern, use your hand to move the overhanging fur out of the scissor path. Pick up all pattern pieces and leftover fur fabric, and bring outside to thoroughly shake off. 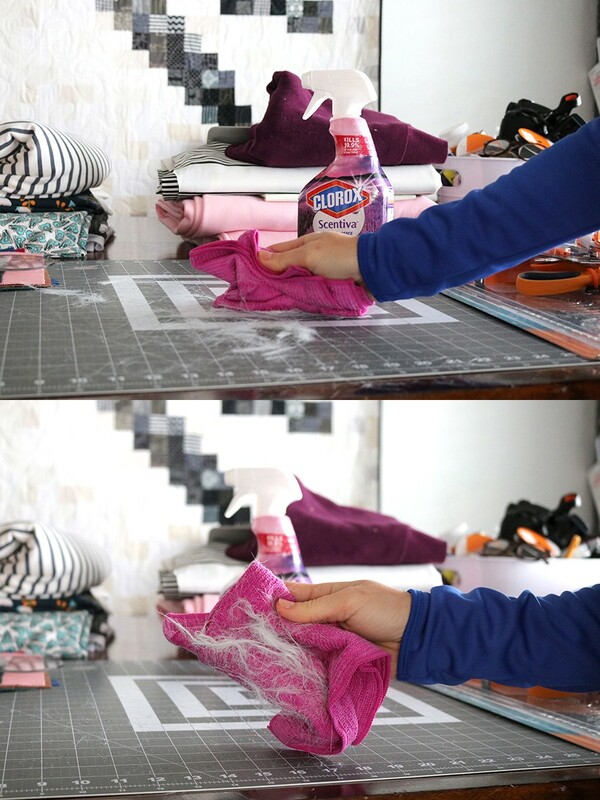 Clean and wipe your work space after cutting the pattern, and before you start working with the fabric. Vacuum, giving the floor a super quick once over to pick up the majority of fur. Gently pull at the side edges of your fur pattern pieces, removing any fur that comes off in your hand and throwing away. If sewing different fabrics, like a lining, wipe down the sewing machine in between steps to help eliminate loose fur getting onto your other fabrics. Continue sewing all steps, wiping down your table as often as you feel comfortable with to help keep the fur at bay. When finished, give your project one last final shake outside. 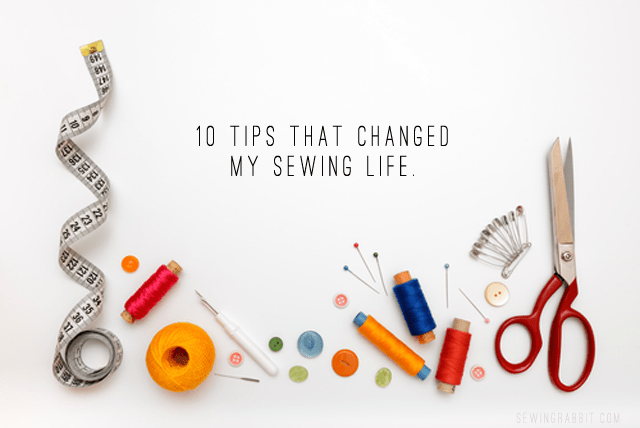 Wipe down your sewing space and sewing machine, and vacuum thoroughly. I found that Scentiva was a great alternative to my old cleaning product. It was easy to use and smelled great, allowing me to clean naturally in the flow of my creativity. And thanks to these sewing practices, I will not be picking up fur for the next week all over my house! (Flashback to sewing a full grown man GRINCH costume last Christmas….oyyy). My studio is clean, and I have a great new minty fur heart purse perfect for my kids this Valentine’s Day. How to sew an easy fur heart purse, perfect for valentine’s day! 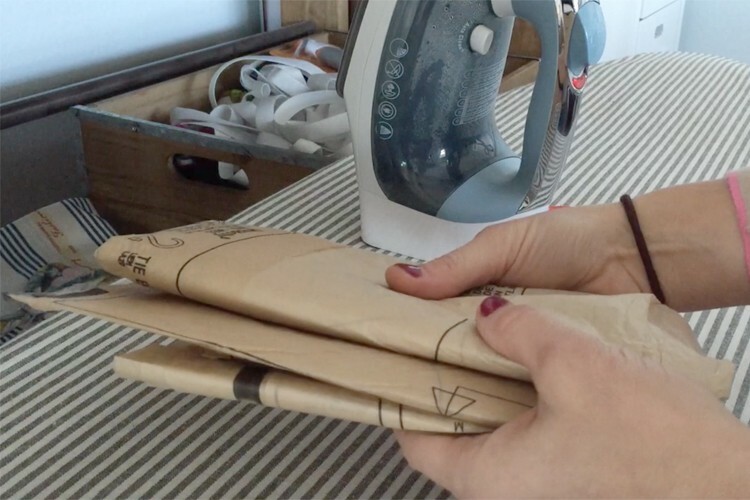 Take a basic piece of paper, and fold in half. Cut out a heart template for your main pattern piece. 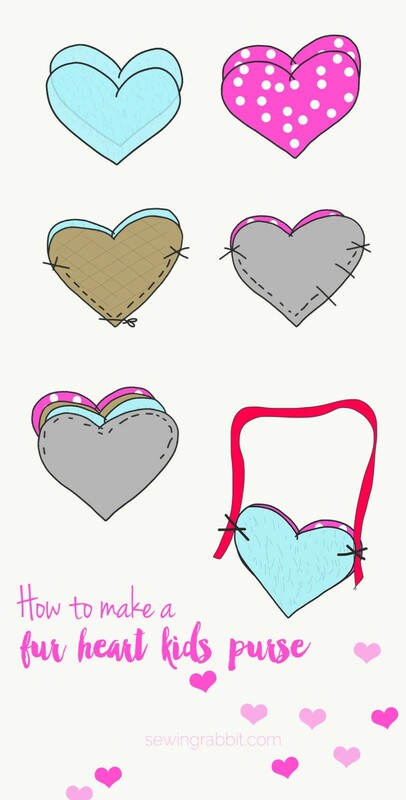 Place your 2 fur hearts right sides together, matching up all seams. Pin around the bottom of the heart, pushing the fur out of the way, stopping about 3/4 of the way up on either side. Sew using a long stitch length. Clip bottom seam and turn right side out. Gently pick out fur from sewn seam. Place your two lining hearts right sides together, matching up all seams. Pin around and stop at the same point on the sides, leaving a 4″ opening for turning. Sew using a regular stitch length and clip seams. Slip the lining around the fur heart, right sides together matching up the side seams. Pin the top opening together all around. Sew and clip all curved seams. Turn heart right side out through the opening in the lining. Whipstitch lining opening closed and push lining inside of purse. Place the rope on either side of the purse side seams and pin in place. Sew to secure. Sew velcro to the upper edge lining of the purse, with the hooks and loops on opposite sides. Thank you to Scentiva by Clorox for allowing me to try out and review their brand new all-in-one cleaning solution. There are some name brands that you instinctively trust to get the job done. As with all things Clorox – Scentiva kills 99.9% of viruses, bacteria & cleans, disinfects and deodorizes. So your home or studio will not only be guaranteed clean, but will smell GREAT. Scentiva is available at your local Target store, and if you act fast you can currently get 5% off Scentiva at Cartwheel between now and 1/31/17.